Cigarette Burns flies the battered and bloodied flag of celluloid, screening 35mm and 16mm genre magic wherever there’s a projector. Over the past 9 years, we’ve commandeered the screens at The Barbican Centre, Leeds International Film Festival, Regent Street Cinema, the ICA, The Prince Charles, The Rio Cinema, the Phoenix Cinema, the Duke of York’s in Brighton and many others. In December 2016 we welcomed director John Hough on stage for a discussion and Q&A with author Kim Newman along with a screening of the Mount Everest of haunted house films, Hough’s very own The Legend of Hell House. June 2016’s She’s So Giallo series celebrating the women of Italian thrillers at the Barbican Centre, featuring Edwige Fenech in Sergio Martino’s All the Colours of the Dark, Marisa Mell in Fulci’s One on Top of the Other, the fantastic Mimsy Farmer in Dario Argento’s Four Flies on Grey Velvet and The Frightened Woman featuring Dagmar Lassander. September saw us celebrating Italian genre cinema with the UK premiere of Corrado Farina‘s HANNO CAMBIATO FACCIA aka They Have Changed Their Face and in November we hosted a Pupi Avati double bill of THE HOUSE WITH LAUGHING WINDOWS and ZEDER with Avati in attendance for an extended discussion on his career. Halloween 2015, we celebrated our first all celluloid, All Hallows’ Eve All Nighter at the historic Regent Street Cinema featuring music from Those Unfortunates and HALLOWEEN III, TOURIST TRAP, CHRISTINE, SALEM’S LOT, and ZOMBIE FLESH EATERS. For Valentine’s Day, 2015, we offered our first twisted love greeting with Stephen Thrower and Jess Franco’s VENUS IN FURS on 35mm. In November 2014 we hosted a five film retrospective The House of Walker. Focusing on the works of British Genre Master Pete Walker, at the Barbican Centre, featuring discussions with David McGillivray and Pete Walker with Jonathan Rigby. We brought Michael Mann’s THE KEEP to London’s screens, along with WITCHFINDER GENERAL and LET’S SCARE JESSICA TO DEATH. Working with Zipangu Festival, we introduced the mushroom menace MATANGO to London, along side the University of Kent, we shared THE NIGHT EVELYN CAME OUT OF THE GRAVE, indulged in post hippie LSD freak outs with BLUE SUNSHINE. 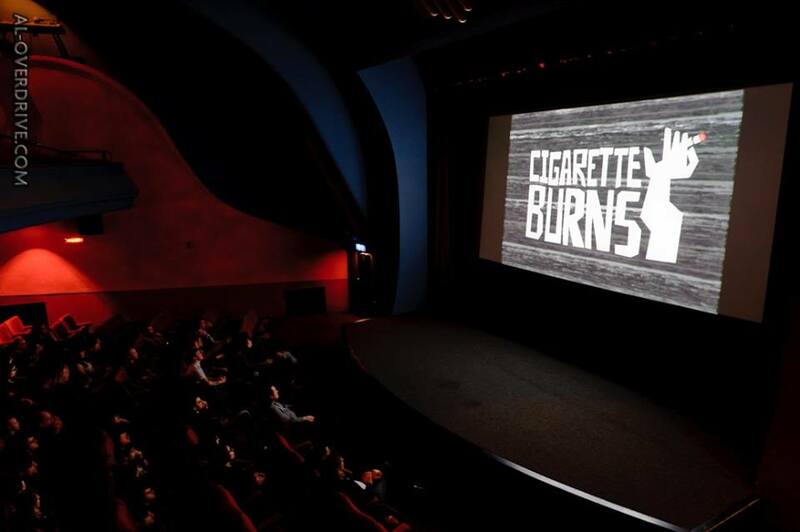 Cigarette Burns has hosted the occasional preview screening, HD remaster screening, and produced a Hallowe’en anthology play THE HALLOWE’EN SESSIONS co-written by KIM NEWMAN, ANNE BILLSON, MAURA MCHUGH, PAUL MCAULEY, SEAN HOGAN and STEPHEN VOLK, and directed by SEAN HOGAN. Championing the small format we embrace 16mm, screening John Carpenter’s THE FOG in a deconsecrated church with Death Waltz Recording Company. Keep up to date with what’s next, head to our front page, like us on Facebook, follow us on twitter or sign up for our mailing list, whatever takes your fancy.